David Nalbandian is one of the greatest Argentinian tennis players of all time and one of the most exceptional athletes in the history of the sport. Born a winner, he ranked in third place in the Association of Tennis Professionals tour, remained in the top ten of the rankings for five consecutive seasons and showed an indisputable love for his country when defending Argentinas blue-and-white jersey in the Davis Cup. With each victory, Nalbandians last name resounded louder both in local media and in sports sections around the world. He has an unmistakable accent from Córdoba and an Armenian mien, but its the last three letters of his last name that tie his identity to his grandfather Kevorks heritage. Kevork Nalbandian, or Jorge, as he was called in Argentina, was born in a town in Eastern Armenia (part of the Russian Empire) around 1909. He was an only child and was raised by his aunt and father his mother died when he was just a baby. His father served in the military and one day left for the battlefront, never to return. The last time my grandfather saw his father was after a mass in the Armenian church. They had to leave the church because the attacks had already begun, David recounts. After the Russian Revolution and with the Russian troops withdrawal from the Caucasian front, the Ottoman forces launched a counterattack and soon took control of Western Armenia and large parts of Eastern Armenia that belonged to the Russian Empire. My grandfather managed to escape. At the age of 12 he arrived in France after crossing the Black Sea and the Mediterranean by ship as a stowaway, David says. Later some relatives living in Buenos Aires obtained documents stating that Kevork was an adult (which he wasnt), so that he could enter Argentina. We have no record of that because my grandfather was a man of few words, says David. Even so, the family still keeps his memories alive: From the family talks we remember the suffering and hunger he went through, how he was forced to escape with no means of subsistence, having to cross deserts in which thousands of people died. It was not something he spoke much about: he would start crying every time and could never finish his story, David remembered. Kevork used to commemorate the Armenian Genocide by closing his shop, as if it were a holiday. He prayed and read the Bible in his mother tongue; this was the only treasure he was able to rescue when he was forced to leave his home. On each anniversary, he kept his feelings internalized. He didnt want to discuss the subject, it made him too distressed. He was a cheerful man and you would never see him joyless or suffering. I dont think I ever saw him sad because of those memories. He always wanted to move on and seize the moment, David says. On the centennial of the Armenian Genocide David, together with other public figures, took part in a TV-spotthat sought to raise awareness of the events. It was a timely initiative that was replicated throughout the country and had a significant impact. This is part of my history, of our history, where lending a hand is always a good thing to do, David said proudly. Davids grandfathers ancestral lands had been expecting him for some time. In 2008 David came in Armenia to partake in an exhibition match. I have seen many cities and cultures throughout my career, but being in Yerevan is impressive. One sees things differently with the eyes of the past, of the family, of recent history. Armenians showed much love and hospitality to their honorable guest. What struck me most were the people. They are very attentive, helpful and cordial, David believes. He is perceived as a hero not only for his sporting achievements, but also for his attitude toward his roots: Regardless of the language barriers, I could tell they were really attached. By the simple fact of being Armenian, they see you as their own, as a close relative. This is proof of the affection and unity that exists in the Armenian community. 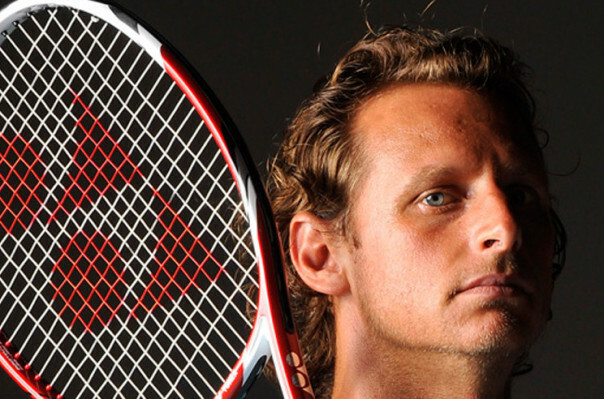 For the first time Nalbandian picked up a tennis racquet at the young age of four. A number of families from Unquillo (a province of Córdoba, Argentina), including the Nalbandians, opened a small club where they built two tennis courts. First he spent the weekends there with his family and friends, and then began visiting on weekdays. The first steps were more social, I had a great time there. I spent hours holding a racquet and didnt even think I was going to devote my life to it, David remembers. As a boy, he played every sport imaginable: basketball, soccer, swimming, horse riding, tennis, BMX. When I was ten or 12 I started putting more time and energy into tennis, David says. Today, his athletic spirit is more alive than ever: Whenever I can, I try to do something. I play golf, soccer, go fishing, race cars or play polo. Standing still is not an option, he laughs, adding: There will be time for that later. At 14 he became the world champion in Japan and in 1998 he won the U.S. Open junior title by beating Roger Federer, who would later become his frequent opponent on the courts. With determination, he pursued his career and reached the number one position in the Argentinian and Latin American rankings. Crowned in his hometown as King David he flaunted his elegance and outstanding gift for the sport in every game. With his unbeatable backhand he won numerous tournaments, obtained 11 titles, became a Wimbledon finalist and reached number three in world rankings, competing against strong opponents like Rafael Nadal and Novak Djokovic. David has traveled the world, but always returned to his hometown. Unquillo has always been my safe haven; the place where I returned to restore my energy and unwind. I always needed to come back and spend time with my friends and family, so as to come back to the circuit with more energy, he says. His performance as part of the Argentinian team at the Davis Cup deserves a chapter of its own. When representing the country, he gave his all in every match. I always liked playing with the national team. Every time I wore the Argentinian jersey, it felt differently than just playing for myself. You have another responsibility, another commitment, people even look at it differently, he smiles. has climbed the podium five times and won the Maxi Cup at the local Vuelta de la Manzana rally. Sports help you feel included, related, it is through them that you learn codes of competition, friendship and rivalry. These are all great values to incorporate in your daily life, your work, in any social context, Nalbandian believes. In 2007 the Nalbandian Foundation was set up with the goal of promoting human development and social inclusion through programs focused on health and sport. We try to find the right sport for each person and we encourage people to spend a few hours a day doing it so that they can enjoy themselves and have a good time, David says. The organization aims to promote actions meant to reduce the effects of exclusion and discrimination. Highlighting the close link between heath and sport, the foundation offers many programs for childrens development. We started with that, and then we opened a rehabilitation center. We expanded our reach because we noticed that the needs are huge. Were trying to help as much as we can, David says.